Canine Hoopers UK Accredited Instructors are some of the best in the business! As individuals they have been put through their paces during our intense courses and thoroughly assessed on multiple factors. 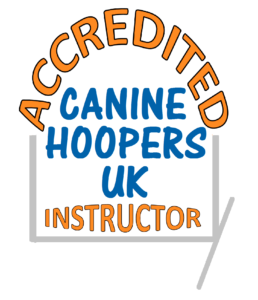 Only those instructors who can demonstrate the high standards of training we require become Accredited to Canine Hoopers UK and they wear the Accredited Instructor badge with pride. We are fully committed to making high quality tuition accessible in all areas of the UK and all of our instructors use only force free, modern training techniques. All of our instructors welcome dogs large and small, young and old and will always make provisions for those who need a little bit of extra space or understanding. If you think you have what it takes and would like to offer the very best of hoopers training to your clients then we’d encourage you to become an Accredited Instructor by attending one of our comprehensive instructor training courses. We are the UK’s premier provider of Canine Hoopers Instructor training and our courses have been specifically written for the sport and are recognised and supported by The British Institute of Professional Dog Trainers. All courses are delivered by our in house trainers who are not only qualified instructors but also have many years experience in writing and delivering training, in coaching and also as assessors across a wealth of industries. Their passion and enthusiasm for the sport and accessible training is infectious and our courses are designed to set you in the best stead for your teaching journey, whatever your start point. Being an Accredited CHUK Instructor is a wonderful way to offer a new, dynamic and exciting sport to your clients as well as attracting new clients in your area. You’ll be part of a close knit support network and well poised to help develop the sport in the UK. You will also benefit from free advertising opportunities, the chance to represent CHUK at events, exclusive merchandise, special offers on equipment and discounts on training and workshops. There’s no ongoing affiliation fees, all we are interested in is having talented, approachable instructors out there teaching hoopers and ultimately changing dogs lives for good! Level 1 – For those offering Canine Hoopers UK training in their clubs at beginners/foundation level and building your customers up through Starters and onto Beginner competition level. You must attend a Canine Hoopers UK Level 1 Instructors Training course. You must pass the Canine Hoopers UK Level 1 Instructors Assessment. Our intensive 1 day Level 1 course is aimed at instructors who are already teaching dog sports to their clients or established instructors who are looking to add to their offering. Our 2 day level 1 course is aimed at those who would prefer a less intensive learning environment or would like the opportunity to look at core teaching skills and the sport in more detail. Both courses have the same hoopers based content and same assessment process. Level 2 – For those wanting to build on the foundations that they have been teaching for some time and to build on their offering, specifically working on distance handling and handling challenges, setting safe yet complex courses. Building your clients up through Novice competition standard and further towards Masters and Elite. You must have passed the Canine Hoopers UK Level 1 Instructors Exam to be accepted on the Level 2 Training Course. You must be able to demonstrate a good working use of your Level 1 training and have been actively training hoopers to multiple dog and handler combinations for a reasonable time. You must attend the Canine Hoopers UK Level 2 Instructors Training Course (2 days). You must pass the Canine Hoopers UK Level 2 Instructors Assessment. Interested in becoming an Accredited Canine Hoopers UK Instructor? Head to our BOOKINGS site to view all available course dates and to book your place. Be assured in the knowledge that our Accredited Instructors course has been commended by one of the leading and longest standing professional canine educational providers in the UK.